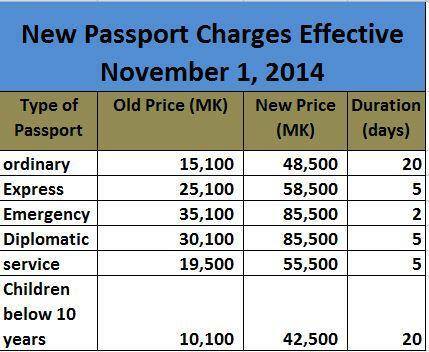 Finally the Malawi Immigration Department has finally hiked passports fees. The development comes barely a month after long hilted debate on the issue which forced some Malawians to converge in large numbers at the Immigration Offices in Blantyre as well as Lilongwe offices to have passports processed before the due date. According to a statement issued by the department, the hike is effective November 1. The ordinary Passport which lasts for 20 days to be processed has increased to MK48, 500 from MK15,100. The Express type of passports is now at MK58, 500 from MK25, 100 and takes 5 days to get done. The Emergency passport has been hiked from MK35, 100 to MK85, 500 and takes 2 days to be effective. On the other hand, the Diplomatic passport which takes 5 days to be processed is now at MK85, 000 to MK30, 100. The hike has also seen the Service type of passport be pegged at MK55, 500 from MK19, 500 and takes 5 days to get fully processed. Below is the new price list……..
What’s going on,this is not what we are expecting for,this is not developnment,i ask the government to think for poor people.